the Crescent River in Alaska. The field that lies outside my office window has been telling me a story. I have watched this field change all season. In early June it was an exciting new growth of bright green. It was fun letting it grow, letting it be free, after being mowed for at least ten years. As the stalks of grass grew taller, the tips became tinged with pink. When it rained, the entire field would lie down in oddly shaped and awkward clumps. It appeared as if elk had taken their nights rest there, yet I am sure it was just the weight of the moisture on the fragile stems. I would stare at it and wonder if the dryness of the next days would revive it. Sure enough, within that time span, the stalks of grain would be righted again, and moving in the summer breeze. The tips have changed now from a bright pink tinge to an all brown field, the color tone of late summer. The lower stalks are still green. I expect they will slowly fade to an all brown, until the fall rains begin. This morning there are wisps of fog gently hovering over it. I wonder what kind of birds nest within it. I wonder if there is a deer and her fawn laying somewhere protected in it. What surprises does it hold? Yesterday, Andrew spoke words that I had longed to hear for quite some time. "These summer days last so long!" The long, endless days of summer that I had remembered as a child had come to him! My hope is that it is this summer that he remembers as he raises his children. Summers are meant to be long, endless days, where boredom occurs but it isn't bothersome. I see both the boys laying out on the trampoline on their backs, staring into the sky. I get reports that they have seen a downy woodpecker on the upper deck, or an eagle gliding down the river, hunting for food. They tell me they almost stepped on a crawdad while wading, or that the river is warmest in the spot behind a certain rock. They have created their very own whirlpool in the upper river where it flows fast over the rocks. It comes complete with a rock chair to sit in, as the water rushes all around them. It is that rush, such as that water, that I have felt all summer. I have planned trips and traveled. I have tried to stay up with my internet work, and I have entertained company. I am leaving for Alaska in two weeks. When I get back, I pack for Diamond Lake. I have mountainous piles of web work to do, and every day seems to fly by. But maybe, I think to myself, I am wrong. I am not busy. I have watched the field grow this summer. I have seen the changes, and taken note. When summer is slow, the way it should be, you can watch the grass grow. I have. This weekend, however, I didn't even glance at the field! Bill's stepson, Steve, his wife, and four girls came to stay. Count em, my two kids, his four, and four adults. Phewie! They wanted to go crabbing. It was a lousy crab tide, but what the heck? The sun was shining, and it was a great day for boating! We got everyone up, and after a fine breakfast of sausage, french toast and bagels, we headed to The Garibaldi Marina. When we arrived in the mid morning, we saw people coming in with boat loads of silvers. I saw one guy with a fine chinook in his box. I guess the bar was very quiet and pleasant, Sunday morning. We are in for a fine silver season, ladies and gentlemen... And I am ready! Bill shuttled us in groups out to the Bay Ocean Sand Spit. He dumped us all, group by group, on a beautiful sandy beach where the kids instantly waded hip deep in the cool, salty waters. We would take turns hopping in the boat to drop and pull pots. The kids would come back, smiling, saying... "We got one more crab!!!" We chose a wind protected area to relax, and were totally oblivious to the fact that the wind had blown up on the big bay, and white caps were forming on an outgoing tide. It was time to shuttle back to the docks, and I was sunburned and sitting in the bow of the boat. The first wave we took over the bow hit me hard. I took in a deep breath and I swear I couldn't breath! It hit me square in the back with quite a bit of pressure, but mostly COLD! At first I thought Bill did it on purpose as a joke, and I hurled some unpleasant looks and gestures at him. Poor guy! He didn't mean to! It was really, really rough out there! We took several more waves on, and I was in shock and totally breathless from the cold! By the time we got back to the docks, I was totally saturated, and so were the kids. They giggled. I did not! You really have to watch those waves that form in the afternoon. A smaller craft would have had to go in and forget their crab pots. We ended up with 5 fine crabs, a little soft, but not bad. to all of you Ifishers! I am escaping the crowds and trying to keep a smile on my face. I am missing my kids, and missing the tradition of doing sparklers with them, and such. They are getting older and the new tradition is for them to spend the day with their Dad. Independence Day, I suppose. We used to make a cake that had blueberries for stars and lined up strawberries for stripes. I may still do that, just for me! But right now, I'm going fishin! Light a sparkler for me! Had a great time yesterday teasing the Cutts in Tide water on the North Coast here in Tillamook. Not a soul on the water. I think we caught 9 over 10 inches. This one was a fat new one coming in at 14 inches. I used my new TH rod, and although it was a bit long for small boat fishing, it was sure fun to play the fish on! I posted some great pictures on the Winners page. One of a Deschutes trout release, and one of Jim Erickson's brother Bill with a fantastic Sturgeon KEEPER!
" We ended up with 5 fishers, me, my three nephews (ages 11, 14, 18) and the eldest nephew's girlfriend (age 17). We came home with 10 fish, two of which were 14 and 18 pound chinook caught by the girlfriend. A very good time was had by all!" Sounds like a worthwhile trip! I'm off to go get the boys. Someday really soon I am going to put up the bass and panfish discussion board, so be patient! These things take time! The past few days have given me some needed peace. A 'time out' of sorts. A break from pressing tasks, travel, vacation plans, web pages, and book keeping. My leisure time is not totally merited, as I have a couple projects that I have pushed back in my mind, so daunting and scary, that they stifled me away from my computer. Nonetheless, I have taken some time away. Last night I attempted to sleep on the river bank with the kids. The thick hatch of bugs had me in the house within hours. Ish! I wasn't hungry, but more of those things landed in my mouth than in the river! I soaked in the sun on my back deck. I read too many chapters of a book called, "The Egg and I" that was loaned to me. Darned if I can tell who wrote it, MacDonald? It's a lovely book about life in the country, raising chickens. "The Egg and I" allows me to relax, read leisurely and not concentrate. I take time out, occasionally, to stare up into the blue skies and the trees that tower all around me. Thank God the trees have been generous, and allowed enough blue sky overhead that the sun peeks through. The trees seem so powerful some days, that I feel the need to pardon myself. "Excuse me, trees, we just need a little space here to live!" In the winter time, they are more stingy, and the sun may not touch our meadow all day long. Oh, does the warm sun feel good lately! I feel like my body is at a sun deficit. I need to soak it up like vitamins! How could the sun possibly be bad for me? I need it! Everyone has a place to practice casting. Be it a yard, a driveway, or a roadway with very little traffic. I walked into the house, refreshed by the cool wooden floors and the darkness. I grabbed a tall ice water and sat down to a video loaned to me by Stan Fagerstrom. It is a fly casting video series by Tom White. Wow! This guy is great! I watched a half of the first one before I left for Black Butte, and learned quite a bit. Now that I had practiced a bit, the words he spoke took on a new meaning! He has me learning the pantomime of double hauling. I keep my hands busy while standing in the grocery line, stopped at stop lights... "Pull back, stop, forward, 45 degree angle... pull! It's like learning to pat your head while rubbing your tummy, and after you get that down, it happens! Magic! I can't impress on you the value of learning to cast, whether it be spin fishing or fly fishing. Videos are a help tool, well worth your weight in fish. My first exposure to a casting video was by Stan Fagerstrom. He produces a very fine learning tool in a video entitled, "Better Casting Means More Fish." I was impressed and educated by what I learned. Stan is a wonderful teacher and dedicated master caster. So, I spent the rest of this summer afternoon out in the yard, fly rod in hand putting my pantomime to work. I got out nearly 50 feet! I can double haul! I am going to try and locate a source for obtaining these videos. I have the Stan Fagerstrom Video, available here at ifish. Bill and I both enjoyed every minute of "Better Casting", and we both apply the techniques Stan shared. It's not the fish that you catch, that makes a fishing day complete. It's knowing that you know how to catch the fish. I don't know about you, but I am going to spend the rest of my lifetime perfecting my fishing skills in any form that is put before me. I love to fish. When a new method is put before me, and I can't do it, danged if I will put my rod down until I have got it down. Back out to the lawn. Sigh... back to the hospital for more oral surgery. Andrew's oral surgery in December has proven to be an 8 month nightmare. They left gauze packing in one of his surgery openings and have missed some of it four times now. Now it has grown over and healed and they have to go back in. How can they look at it and tell Andrew all is well, (although he was in extreme pain), and send us on our way so many times? I'd call and receive the "Mom... quit worrying..." attitude, so I almost did quit worrying. Glad I didn't though! Keep on your toes! They missed it at surgery, they missed it at pre-op check, they missed it when I drove him back to inquire about all the pain, (twice), and then when Andrew found it, and had it removed in ER, I took him back for them to check him out and they missed another piece. The first nearly foot-long glump of gauze Andrew pulled out was sickeningly rotten! What will this piece look like after 8 months? Andrew has Mitral Valve Prolapse and a leaking aorta. He has to be very careful about bacterial infections. It's just a small thread, but during a local dental check up, our dentist discovered it, called me in, and showed me that with a slight tug, it wouldn't come loose. So it is tangled up there, and healed over. Andrew has medicalphobia now. He is so disgusted by the smell of anything antiseptic that he gets really nervous and says he feels faint. Is he faking it or does this really occur? I dunno. 8 surgeries he has had in 13 years of life. ARGH! Don't get me wrong. I still recommend OHSU for almost anything. The folks up there are great! But.... mistakes happen. Will they get it all this time? P.S. I got up this morning and I swear I smell fall in the air! FALL! SALMON! STEELHEAD! Go Willie! Willie finally did it! I know he is in Alaska, but I don't know the details on this fish! Wow! Another fish over 60 Lbs! Fishing? What is that? I haven't fished in a long time! It seems I am so busy lately I don't have the time! I miss it, so much, and am having a bit of a pity party today. I have so much work today that the list I wrote of 'to do's' took me an hour alone! I am going to try and do a little fishing today... somehow! Andrew's surgery went fine, he is sleeping soundly. Check out these deals! WOW! I want to try one! Whoo hoo! We have a bass and panfish board! Tillamook area doesn't have the lakes that I used to have handy for this type of fishing, and I miss it. I fished Coffenbury, Cullaby, Sunset and Smith Lakes for bass and panfish. I rose early in the morning, before any of my neighbors were up. I packed my rods, and headed out to my lake of the day. I met some of the most wonderful people on the dock at Cullaby Lake. The water was glass like in the morning, most always with a cover of fog lifting from the Lilly pads. My memories take me back to an older couple who would meet me there every morning. He was an avid trout fishermen and would catch those stocked trout when no one else could hook them. His wife was always there next to him, with the same excitement and dedication to the sport that held his attention. A fine union. The only kind, and the kind I dreamed of having with my mate. They were always glad to see me and welcomed my company. We shared snacks and conversation in the early morning light. Hooking a whole worm onto a long hook with no weight, I would toss it off the dock, and as it fluttered down it would often be attacked by a bass. I spent hours in the very same place, sitting on the hard wooden bench on the dock in the corner, with a bobber and worm teasing the bluegill. Crappies on little white jigs. Sometimes I veered right on my journey and chose Sunset Lake. The water would boil on the shoreline, the carp doing their seasonal spawning. If the rain was coming down in torrents, I rigged up my hook with power bait or a worm injected with air. I leaned my rod over the picnic table and rushed back to my car. My radio was tuned to the morning classical station. Sometimes I wouldn't have time to pour a hot cup of coffee before my rod danced to the echoes of the music. I loved those mornings! I loved to watch the cars drive by, on their way to work, I imagined... I felt lucky. Lucky to have to go haul in a fish every 5 minutes in the pouring down rain, and lucky not to have a 9 to 5 job! Sometimes my coffee cup did not ever get filled before I had to head home to relieve my husband of child duties, before he went to work. My very luckiest and favorite memory is of my husband arriving home from work in the evenings. It was time for me to have a moment without kids. Time for me to sit quietly beside Smith Lake. I crossed our road, made my way through the over grown thickets and huckleberry trees, and finally to the broken down dock that was my very own fishing hole. Rarely did I catch fish here. Peace is what I was after. Two times though, I was rewarded memories that I will cherish forever. The dock that once stood strong on this lake, was failing badly. When I first discovered it, it was precarious and dangerous. I'd have to drag boards from the shoreline to patch holes so I could hop from one to another to reach the fishing water. At one time, I remember dangling my hook, with worm impaled, through the broken slots in the wood. I was shocked by a strong jerk! It was a bluegill the size of my hand! Soon, I abandoned my rod. I grabbed a cheapo pre snelled hook. With nothing more than a worm and six inches of leader material, I caught bluegill after bluegill! I release them all, but apparently they were nesting under this dock! The next year found the dock nearly totally destroyed by storms. After noting this, I trecked back up the overgrown field to get my sturgeon rod, with 40 pound test line. I cast out a large treble hook, and dragged the boards of the broken dock to clear a small area to fish from shore..
Back to a bobber and worm and my bass rod. I thought I had destroyed any chance of actually catching a fish. After all, the water was terribly disturbed by my de-construction. I sat down in the tall grasses staring at my bobber and slapping bugs... lost in thought, enjoying the sounds of the lake and my peace. The wind blew to the south and bobbed my bobber slowly with it. Wait. My bobber went west! Oh, West did it go! Wester and wester and then down!!! "FISH ON!" I cried so loudly that my husband, three house lots away, heard me! "HELP!" I cried! This was no ordinary fish! "WHOA! JEFFFFFFFF!!" True love that it was, he bounded down through the fields to watch and assist. The dang fish promptly wrapped himself around an old piling and stuck fast. There was no budging this critter. He held like the dock should still be standing and sound. He held like he was impaled in cement. He held!!! I pleaded to my husband to help me, help me, help me! Fully clothed in his work suit, he waded for me, into that chest deep, spring cold lake water, unwrapped that fish, and presented to me a 5 1/2 pound bass that I will forever treasure the memory of. True love? Well... Jeff didn't fish much, and he shortly thereafter left the marriage. I can only wonder if he left the family after questioning his sanity. You can only ask so much of a non fisherman. I think I pushed him past the limit. Bass and panfish, or any-fish, I fish. Would Bill wade chest deep in his work clothes after a fish for me? The silhouette of a flitting hummingbird is barely visible against the early morning sky. I couldn't sleep, yet this reassures me that I'm not the only one who rises at this hour. I procrastinate. This is not necessarily a bad thing. When I do, I get a lot done! Bill said he would have started packing 2 weeks ago. I started yesterday promptly at 2 in the afternoon. I was finished by 5... I think! It was all I had on my list to do yesterday, but in the process, I cleaned out my bathroom shelves and collected travel bottles of shampoos and lotions from assorted hiding places, and placed them neatly into a pretty basket to take to the local Women's shelter. I wish you'd do the same. It's much appreciated. OHMYGOSH, I'm headed for Alaska all by myself! Frankly, I'm scared, apprehensive, excited, scared spitless, can't wait, wish I had another week to prepare, breathlessly anticipating, wondering if I will have fun-or miss my kids too much, mixed up, confused and did I mention excited??? I borrowed a lap top early in the summer for my travels, but guess what? I'm not taking it! Na na na nanaaaanaa! I will use what I find for keeping up with ifish. A computer here, a computer there. I will post any entries on the discussion board, so look for my adventures here. I want to meet Bob Ball and his girlfriend. If you need prep info about Alaska trips, visit his site! Great information! I want to meet up with Fishead5 from the board. I want to go clamming. I want to catch an 85 pound salmon. I want to take a float plane. I have been told to be ready to fish the first morning by 3 or 4. Get on the river before the guides, fish till mid morning, nap a while, and then hit the river at 3 or 4 in the afternoon again. "Hey, wait a minute! You got the wrong girl!" I need sleep! "Sleep on the plane, girl..." was the response. Boot camp or fishing Alaska? Yikes! FISH. Clam a little, FISH, FISH FISH. Actually, I arrive on Monday. This is good. Monday the Kenai is closed to power boats. I leave promptly at 9:40, via Alaska Air. Arrive Anchorage at 12:45. Wow! I just looked at availability for this flight that I got online, round trip for just under 300.00. It now sells online for 682.00! Anyway, then I hop from Anchorage to Kenai, departing at 1:30. (Scary, will I make the flight in time? If not, can I take the next hop?) Pick up my rental car, and drive to stay with Kim at Clam Gulch! Wheeeee! By the way, I almost didn't get a rental car! The Avis rep told me people book a year in advance. I was very persistent in calling every day for cancellations and finally scored one! So, then I rest for a while, (or party with Kim at Clam Gulch!) until 3 in the morning, when I am going fishing with Chris Sessions and Kim Katsion. Chris has a group of friends up there. It's his vacation with die hard fishing friends. If I want to fish with Chris, I can't be a sissy. I have to fish when they fish, do as they do, sleep when they sleep. I have a feeling this won't happen often. On Tuesday night, I fly out to this remote Alaskan Lodge. Bears! Bears! Bears! I have a feeling that the next thing I know, I will be back here wondering if it all really happened. I rise at 5, drive 2 hours to Astoria to play for church, 2 hours to come home. I then ready the kids and take them to church camp at 3. Then, I travel two more hours to Portland, go to G.I. Joes to pick up some light hiking boots, go to sleep, wake up and go to the airport. Did I tell you I'm going to Alaska? I am? Did I pack everything? What rods? Oh! I already packed them! Are they the right ones? Will I have time to fly fish? Should I bring my fly rod? I feel as neurotic as this hummingbird flitting from one feeder to the next. Someone want to go with me? Flights are only 682.00! I am taking a break in Alaska. I'll post to the discussion board. Please check here for any updates, and I will answer e mail as often as I am able. Be back Friday, late! I got up extra early this morning, so that I would have plenty of time to worry about my travels! This way, I will be very tired, and neurotic for my trip! Kim Katsion said that I worry too much. Oh great, Kim... Now I worry that I worry too much! I filed my airline e mail confirmation in my file cabinet, and just about packed my car without it. Yesterday I took a break, and grabbed my fly rod. 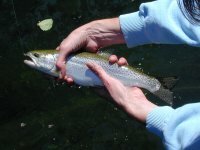 I put on the tiniest of nymphs that I bought at The Fly Fishing Place in Sisters, and caught more cutts than ever! Was the barometer going down? Why are they on the bite? This was mid day! They were all small, 6 to 9 inches, caught in the shallow riffles. I caught a couple in the deep tongue of current in the upper hole, but mostly in the shallows. I also hit the 60 foot mark double hauling in the yard while practicing! Progress! O.K., I have to get rolling here. Have a great week! I will! Wowza! Alaska, a place where everything goes wild! The last night I couldn't waste sleeping, so I was driven around to all the sites in Soldotna and Kenai! We watched the locals dip net sockeye at midnite. We watched a moose and her calf at one in the morning. I sat beside the Kenai river in my car at Two A.M., watching the bank anglers try their luck in a rain swollen river at a 23 foot tide. At three we put the boat in at Centennial (on the Kenai) and took off for a short fishing trip. I then got in my rental car, and drove to the Kenai airport. On the way, I nearly mowed over a Caribou and her calf! A large Moose cow and her calf then sauntered out in front of my speeding vehicle. I thought I was safe and clear, but no! Upon entrance to the airport a black bear challenged me to stay alert, and I slammed on the brakes. I sat there, still in the car, motor running, in absolute wonder and shock. I have a story to tell. Many, many stories, and I will write a bit of it each day, starting out with my travel to Alaska, and ending with my trip home. Stories of float planes, Arctic Char, King Salmon and Lake Trout. Stories of wild adventures, and tales of learning to be cautious of bears. I have grown spiritually and emotionally. I realize, now, that I am not a very tough girl, and that I need to work on some of my fears. I realize that I need to relax more, and worry less. A place where I am not in charge. Where the animals reside, and people are guests. Where weather and nature rules and I stand by, politely, waiting for my pass to go. I could use a few more lessons, and I will be back as soon as I can put the funds together. It's not for everyone, but it calls me. It calls me so deeply that I can imagine myself living there. Living there to learn, to grow, and to fish. I didn't catch my record King, but I caught a record memory. I drove to Portland on Sunday the 15th of July and spent the night in Portland, preparing for the adventure of a lifetime. Bill had me to the airport in plenty of time on Monday Morning. I did all the regular stuff, checked in my luggage, and stood in line at the departure gate. We stood, and we stood, and we stood. As departure time came and went, with no one at the counter, and no plane at the gate, we were all shifting our carry ons from one shoulder to another in wonder and frustrated anticipation. I had worn Bill's camo duck coat, and nearly expired in the heat. In wait, the Alaska bound travelers all became acquainted. We learned names, where each other was going, where we were fishing. We shared a confusion and frustration as to why Alaska flight 139 had not arrived to take us to our dream fishery. The plane was stuck in Oakland, and had not even left there yet! Yikes! After many anxious moments, Alaska Airlines finally got an aircraft together, but had no crew. In good spirits still, we all volunteered to help out. I shouted, "I'll pilot!" Others volunteered flight attendant status... They didn't take us up on it though. Why? I dunno! I've always wanted to pilot a jet, and they turned me down! Geesh! Two hours later, we had a plane and appropriately trained crew. The time of departure meant my connecting ERA flight out of Anchorage would be missed, and others complained of the same predicament. Upon arrival at Anchorage I raced to the ERA gate to sign up for standby. It looked grim. By this time, we were all good friends, these Alaska bound fishermen and I, from flight 139 to Alaska. As names were called on approved standby to depart for Kenai, we all yelled things such as, "Go Brent! ", "You made it, Kathy!" and finally my name came, and I heard, "Jennie!! Go kill um!" Applause resounded through the dimly lit waiting room. Another leg of the journey, and closer to my dream. I boarded the flight, and we laughed our way to Kenai. At her home, I met some guides from Southern Oregon. Small world, it is! JD's guide service, I think? With a smile and a gracious thank you, I was off to find Clam Gulch Lodge. Chris was right! I felt right at home! Everywhere I looked, people had boats attached to their rigs, tackle shops along side the road, fishing licenses for sale, rods, reels, boots!!! Where here we have drive through coffee shops, they have drive through bait shops! :) I like it! Over the Kenai river, down the flat roads, "Brake for Moose" signs stood boldly every couple of miles. Moose? I could hit a moose? I tapped my brakes. Crossing the famous Kasilof river, I glanced down to see bank anglers en mass, fishing for sockeye. Kim Katsion was at the grill. Huge beef ribs for dinner! With a smile and that 'final destination' relief, I yelled out the window... "What the heck am I doing in Alaska, girlfriend?!?" WHEEE! I ate a wonderful meal, had a couple beers, and arranged our Kenai trip for the morning with guide and friend, Chris Sessions. Chris happened to be on vacation in Alaska also, and was gracious enough to invite us along. I unpacked, and put my rods together. Laying out my rain clothes for the next day, and trying to prepare for sleep. Yeah, right! How could I sleep in Alaska? Why would I want to waste my time??? Sleep was not for long. I retired at 10:30, and was to rise at 2:45 for our King trip. Getting used to the long days of light was perplexing and difficult for me. I was so excited I was up and down glancing out the window. Look at the Cook Inlet! Is there any bear near? Looka looka, looka! My alarm sounded and in seconds I was up and running. I was going to fish the Kenai! 2:45 A.M. on Tuesday, July 17th, I woke in my luxury King Suite at Clam Gulch Lodge. In haste, I threw on my clothes and went downstairs to be greeted by steaming coffee and a very excited fishing companion, Kim Katsion. Check off... Lunch packed, bait packed, rain clothes on, we piled in the truck for the 30 minute drive to the Kenai. We met with vacationing Chris Sessions and friends, Joe and Marv. 30 pound line is the minimum for this fishery, and all rods and reels were graciously provided by Chris. With K16 Kwikfish, wrapped, on a couple rods, and bait rigs with BIG spin 'n glows on the others we put in at the Pillars ramp for the experience of a lifetime. Chris and Kim knew the crowd well. It was entertaining to hear about this guide and that, while we weaved our craft through the masses. Oh! The masses! It was Tuesday, the river had been closed to power boats on Monday. As soon as 6 A.M. hit, the river filled with guide boats, anxious to fish those 40 to 80 pounders out of the river for their clients. The Kenai was not as I had thought. In my mind's eye, I saw a pristine river, with glacial mountains all around. What I could see of the river, in the semi darkness, and in between the masses of boats was a river high, fast flowing, silty and glacial. It wasn't long before Kim's rod went down with the power and force of a huge monster salmon! This fish decided to go hide in a tangle of limbs, shore side, and a quick release was made. It was estimated at around 60 pounds. Kim sat down with a frown. Next, Joe's rod went down and he pushed me towards it! Now, I am not one to usually accept a hand off, but I did! Thanks Joe! It was awesome! I landed a 25 pounder, bright and beautiful, and kissed it good-bye as we released him to continue his journey. We decided to pull out of the Pillars and onto the Centennial boat ramp. A fresh cup of coffee and I was ready to fish again! Kim hooked into yet another huge king salmon! Approximately 60 pounds again! This one was landed neatly after quite a fight! Joe held Kim in the boat by the back of her rain pants! That fish wanted to pull Kim in, and Kim wanted to pull it in! Kim won! I got a taste of bad manners displayed on the river by a boat and captain who refused to move for us as we chased the fish. Near collisions are expected on this river! It was so fun watching Kim catch this fish, even though my sister called at the exact moment that I wanted to be involved. She absolutely NEEDED to talk to me about planning our family Diamond Lake trip! Argh! My batteries were out on my digital, so I didn't get a picture of Kim's fish. Chris did, and I will post it here as I put my pages together, with pics for the final Alaska tour pages. Back to Kenai I went, met up with Chris, and off to Soldotna to Alaska West Air, a private air charter service. We walked into the office and there, low and behold was a familiar face! Gary Hilton? What a small world! After exchanging Tillamook pleasantries, we learned our flight was leaving soon. Seems the entire guide force heads to Alaska for the summer! I made some final cell phone calls back home and boarded the small float plane with a single back pack for places wild and unknown. I was apprehensive. I'd heard stories of float planes smashing into mountain faces, losing power, stories of ashen faced pilots where you know not to be comfortable. This was not the case! I grinned the whole dang trip! The pilot was relaxed and cheerful. It was breathtaking, flying low above Cook Inlet, snapping my camera for pictures that I will treasure forever! We made our way through the high mountains and up the Crescent River. As we hovered over camp, tiny cabins dotted the village in between tall spruce trees. After the 45 minute jaunt, we landed gracefully in a smooth and glassy Crescent Lake in Lake Clark National Park. OHMYGOSH! Everything I had seen on Disney Movies, on National Geographic pieces, and in my wildest dreams spread out before me! I had to squint to take in all the beauty! The kind of beauty that makes you want to wear a flowing skirt and spin around giggling! The mountains towered over me, so close I felt I could touch the ice capped peaks. We were greeted by gracious hosts, Shan and Eric Johnson. They must have thought I was a Goofy, not Mary Poppins, because I honestly couldn't stop smiling that whole first evening. The weather was absolutely gorgeous. The sunshine added to this picturesque village in the wilds. At the family style dinner table we met the guests that were already enjoying their week long stay. I learned to pick king crab legs (So much different than dungenous!) and had trouble deciding whether I wanted a bite of juicy steak or crab, or a sip of fine red wine! What a feast! For dinner tonight, we (blow, phoo!) had King Crab (blow, phoo!) Legs, and Steak. The weather is (blow, phoo!) warm, with a 2000 foot (blow, phoo!) ceiling. You catch right onto this, like the twang of texans or such. Lights out, and the generator turned off at 10:00. This means no running water or lights till 6 in the morning. Roughing it. Yeah right! Everything at Redoubt Lodge is created to absolutely pamper the guest! We made plans to wake at 4 in the morning and start our fishing tour. Eric was to boat us around to show us the hot spots. Where to catch king salmon, where to catch dollies and lake trout. I was tired and sleep came fast and hard that first night at Redoubt. I totally blacked out in the dusky night, which never turns dark in July in Alaska. But as my alarm sounded at four, I was ready to go! "Look CHRIS!" I yelled across the room to him. We are at Mt. REDOUBT! It's been a long time since I've been up at 5! I'm going steelhead fishing and will write the next edition of my Alaska trip when I return. I haven't been fishing in Bill's boat for a long time! By the way, In reading the book, Steelhead & the Floating Line, by Bob Arnold, I realize I am able to identify with fly fishing only attitudes. As I get older, I am more concerned about each and every fish in the river. It becomes harder and harder for me to bonk a fish. This is difficult for me to admit. There comes a time, however, when I have to decide. I am concerned about the decline of anadramous species. I am not totally convinced yet. My rods are rigged for bait and hardware to go after a steelie for the barbee today. I woke on 18th, to the sound of my alarm. 4:00 A.M., and ready to explore the Crescent river and lake in Lake Clark National Park. The weather was not nearly as nice. Clouds hung low over the lake. I dressed appropriately, with the few changes I brought. We met for breakfast, and what a breakfast! I did gain weight at Redoubt, with all the pancakes, bacon and eggs and steak! Wow! We all met at the family style table. All kinds of fish talk surrounded me as the group staying at Redoubt decided on which species they were going after. 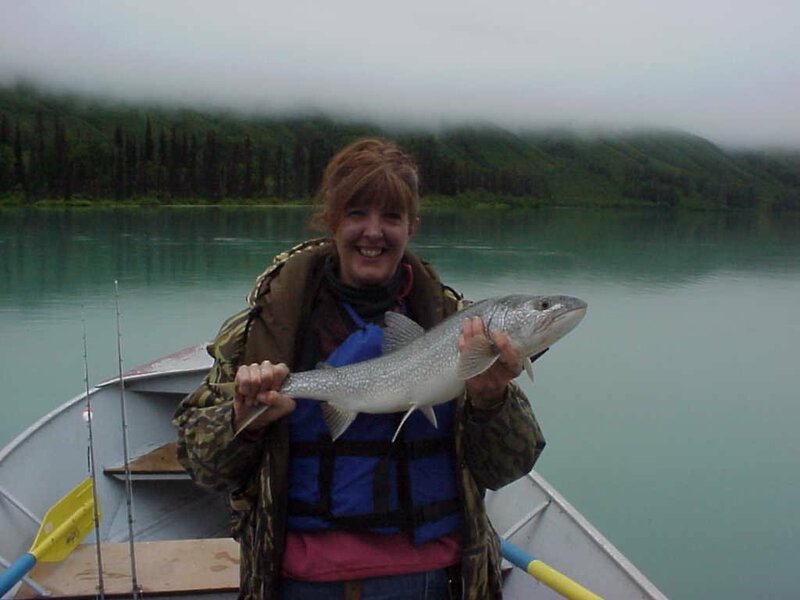 It was decided that one group would go for Kings and the other to learn to fly fish for dollies, char and lake trout. Chris and I were to go with the host, Eric for a tour of the options. Along with the bear cautions, life jackets were issued and mandatory at Redoubt. Safety is primary in everything you do. We hauled off in the sled. All boats are equipped with a 35 horse power 4 stroke Yamaha, and ready for your use. They had landed 20 kings in the boat the day before, and we were taken first to the last area of the river that is safely navigable with our craft. I guess the rapids further down get to be class 4 and 5, so drifting in a drift boat may be questionable. I don't even know if it could be done in a raft. Although we did, it was difficult for us to stay in the boundaries. Further down river called to us every time we back bounced down to the deadline. You can hike down, but Jennie, the-bear-fearing-female didn't consider it an option! Eric took us back, and Chris and I went out to explore and fish on our own. Sockeye salmon rolled consistently on the shoreline, and dolly, lake trout and char showed their life all around us. We didn't see a bear that first day, although we were on constant lookout. The bald eagles were thick in the trees, perhaps waiting for us to release a fish that they could scoop up for an easy dinner. Gary Hilton mentioned that you can get great pictures of an eagle in this manner. I guess the bear come down to the camp, starting at the time of year we visited, and get more prolific through August, September and October as they feed on the fish at the shoreline. It is known as one of the best brown bear viewing places there is. I think we skipped lunch that day, so intent on discovering the area's treasure in fish. We trolled, we cast spinners, we back bounced K16s, we caught fish, and fish, and more fish! Dinner was served that night and the plane that was supposed to pick us up had been grounded. We were socked in. We sat around camp, had a couple of drinks, and headed out again to fish, that evening. The visibility was getting poorer and poorer as the clouds dropped and seemed to touch our heads. Glancing out my cabin, I noticed I couldn't see the lake. It'll clear by morning... until then, I will enjoy! I slept better than I had ever slept in my life. The mountain air, the wilderness, the tall trees, and the mountains surrounding me, holding me tight inside that little cedar cabin. We'll fly out in the morning.... We'll wake to sunny skies and take another beautiful flight on the float plane. Oh no! It's all becoming a blur of fish! I sleepily pushed back the curtains on the 19th of July, and said, "Uh oh!" As you can see above, the fog was pressing down against the top of my head, and there was no way a float plane could land. A steady rain danced upon the cabin roofs. Thinking we were flying out the day before, I'd volunteered to help the crew clean cabins. Hey, I didn't have anything to do, and it made me feel at home! I dutifully stripped the sheets on the beds and put fresh ones on. I scrubbed the sink and toilet, and vacuumed. A lot of good that did, as we just got right back in the beds! I slept in till around 8 that morning. When I got up, bacon, eggs and pancakes were already on the table at the lodge. The smell wandered through the air and pulled me to the lodge, when I opened the cabin door. I was feeling quite a member of the crew by then, and after breakfast, stationed myself to kitchen cleanup while Chris got the boat and gear ready to fish. Were we there for the day, or would it clear? Throughout the day, we were all caught staring up at the sky to check for a clearing in the weather. The crew at Redoubt Mountain Lodge all had plans and a feeling in the air told me frustration was setting in with some of us..
Diane, a very pleasant helper at Redoubt was anxious about missing her boyfriend. Eric and Shannon had people they were going to miss a meeting with. I was still half expecting to get out, but began to wonder about missing my flight home the next day. I have to admit that at one time during this day I had a bit of an anxiety attack. I suppose the fog that hugged us so closely, and the thought of being absolutely abandoned in the wild Alaskan territory, got my heart beating fast, and a smidgen of claustrophobia set in. Wild thoughts filled my head of drifting down the Crescent river just to be picked up on the fog cleared side of Cook Inlet. Ah! I'd never make it! I'm STUCK! The thought of having to pay for another flight out hit me hard. I sat in my little chair outside my cabin and a tear fell down my cheek. It camouflaged with the rain beading on my hair and fell to the ground. My rental car sat unused at the airport, 'cha chinging' 55.00 a day. My kids were expecting me home to tell stories of their church camp adventures. The clamming tides at Clam Gulch! I wanted some clams! The Kenai and my chance for a king! My bunnies, my chickens, my Kilchis! "I wanna go home!" ... and I did want to go home, at that very minute. I couldn't find sympathy from anyone. "We are not here for a long time, we are here for a good time!" "I've never seen anyone so upset being stuck in the most beautiful place on earth!" Although at the time, I didn't take comfort in these words, he was right on. There was nothing I could do, and he wasn't about to sympathize with me! I had no choice but to become convinced. There was nothing I could do... but enjoy my surroundings. So I wiped my tears and got over it. Now looking back, I wish I would have enjoyed my time there EVERY minute, with no apprehension, but the past lies as it is. A valuable lesson learned. Reality hit, when I asked Shan if she would like me to strip the beds again. "No, Jennie, I know your heart is in the right place, but you would probably have to do it again tomorrow". I swear it was her chocolate cake that finally made me feel comforted and smile again! The river had come up 2 feet and sloppy waves lapped against the newly created shoreline. The ceiling of fog and clouds was still coming down, and the lake and river coming up. The squished living space in between was becoming smaller and smaller, attempting to envelope us. The air, thick with moisture, left everyone speaking in hushed tones. Chris and I thought we would go out for a bit of fishing, but were instructed to stick around camp that day to see if the plane would be coming in. We packed our bags, did everything we could to be ready, and ended up napping most of the day. We became very good at deciphering plane noises. Twin engine planes were flying high above the cloud cover. We'd hear an engine from a distance and freeze to listen. "Nope! Not a float plane, too high...."
At five or six the call came in. No plane for us today. At that moment, Chris and I headed for the boats and tackle shop and began to prepare for an evening fish. Let me tell you about the tackle shop! My Gosh! I couldn't believe it! It was a full cabin, loaded 40 or more G Loomis rods of any type you can imagine. One for every type of fishing, fly, cast or spin,-- silver salmon, king salmon, lake trout, or char! On the opposite wall were racks of hip boots to fit every foot. Above that, rows of life vests, nets and seat cushions. A wall separating the cabin offered a fly tying bench, a display wall full of unopened spinners, leader material, line, fly tying gear and tools. A refrigerator held bait. Shelves were stacked high with tackle boxes, already filled for a day of fishing. K 16's in one, an array of spinners in another or a box of flies. It's your tackle room dream come true! After fishing, and quite late at night, I joined Diane on the back porch of the main lodge with a glass of good, warm red wine. We talked of her life in Alaska, her boyfriend, and her dog, as dusk hit camp. I made intermittent calls on the satellite phone, (at a buck a minute!) to alert car rental companies, Bill, and the airlines to my delay. I entered the lodge at much past midnight, and joined Chris and Shan's son. They were listening to a taped recording of "A Prairie Home Companion" with Garrison Keillor. Garrison's voice lulled me to a groggy state. I wandered back to the cabin, lay my tired bones down on the bed and drifted off to that deep, Redoubt Mountain sleep that I haven't known since. Just got some awesome G Spot blades in the mail, made up some dangerous spinners, and have to go after a slammin salmon on Nehalem Bay. No AK talk till later! It's one of those 'sure about catchin' days... I have a feelin'!!!! Andrew had a devoted follower. One of our flock of chickens adopted him. Andrew named her Chicky Baby. When the chickens were out grazing and Andrew opened the door, Chicky Baby would run and half fly across the yard, in an awkward side-to-side jaunt to greet him. "Andrew! Andrew!" she seemed to say. He held her while resting on the back deck. He fed her by hand, and brought her into the house for left over goodies in the bread bin. She slept on his lap while he stroked her feathers. She was friendly to us all, but it was apparent she was attached to Andrew. Chickens have personalities. They talk to you as you greet them. Some are shy, some, out going, but the way we love our chickens, you would think we had a kennel of chocolate lab pups. Chicky Baby was social and friendly and loving. She brought many smiles and giggles to our family and friends. It wasn't unusual to be dining outside on the deck with a Chicky Baby on the table. Last night, after taking a bath, I crawled, exhausted, into my flannel sheets and started to doze off. Bill came in to tell me we had a sick chicken. It was Chicky Baby. He found her out of her roost, too tired to cling onto the wooden rod in the night pen. I rose, put on my robe, grabbed a flashlight and went out to check. I found her, not able to hold her head up, half fallen over in the dust. I gathered this sweet chicken in my arms, and brought her in. I spoke to her in a soothing tone. She was drowsy and weak, barely breathing. I, trying to help, force fed her a little water, and I believe she choked to death. I did the wrong thing. Andrew watched the ordeal until he had to leave the room. Chicky Baby died in my arms. The fact that I may have killed her, by drowning her haunts me so that I didn't sleep last night. After the fact, I'd remembered that someone once told me that chickens were so dumb they could drown in one drop of water. Is this true? Everyone reassured me that "Mom, she would have died anyway...", and "You were just trying to help..." but nothing seems to be able to calm my soul. Andrew lost his favorite pet. Believe it or not, I tried to give this chicken CPR! I stared at her limp body and thought perhaps she would wake up. I felt for a heart beat... None. I willed her to come to life! She didn't. She hasn't still. Last night, tear soaked and restless, Andrew, standing tall and solid, came to my bedside. He offered me a Chicky Baby feather that had dropped on the kitchen floor. "Keep this." He said, as he handed me my memory. -over the loss of a pet. 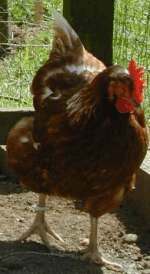 A pet chicken, named Chicky Baby. I have always been very conscientious of being on time for things. Airline flights, especially, and I have everything in order the night before I leave. No wait, I have everything in order the month before I leave! The tickets, itineraries, rental car information, all at my disposal in a manila envelope. Imagine the feeling of being stuck in a remote area of Alaska the day your flight is supposed to depart in another city! This is tough for us obsessive- compulsive traveler types. Whatever slight hope I held that I still might make it to my flight that day, vanished. I pulled the curtains open in the early morning to find thick, dense fog that hid any signs of that a lake existed 100 yards from my cabin. My ERA flight and my Alaska flight would depart without me. Guess I'll have to fish.... Darn! A shower! My first soul purpose in this day was to take a shower. It had been three days, and three layers of mosquito repellent and dust. I had planned on showering the night before, but Chris and I fished too late, and the generators were off by the time we returned to camp. I left Chris to his shower first, and when I came back he was shivering and refreshed. The hot water wasn't working? Leave it to Chris to take one anyway. Brr! Not me! I reported the problem to Steve and he had it fixed and running hot in no time! Ah! Hot showers! Shampoo, conditioner and a razor! What a luxury! I felt SO much better. I grabbed a piece of hot sausage to go out of the kitchen and hopped in the boat. We took a two way radio in the boat in case a flight was to come in. The lake was still and glassy, high, and a bit murky, but the fish were still showing all around us. We fished the current seams of the Crescent river with K 16's in hope of a chinook, but hooked several lake trout instead. Lake trout and dollies it was. We switched to spinners and threw to their rises. What a blast these fish are, and so compliant! Any spinner you choose produces! We noticed some clearing in the sky, and listened for the sound of a float plane or radio alert, but no news yet. While throwing spinners, I noticed Chris standing tall with a 'what the heck' look, staring up river. "What is that? A bear!" Oh boy! I thought! It is! It is a bear! The bear that we had all been waiting for! Let's go! I was scared a bit, but excited! Pull the rods in, start up the engine, let's go! 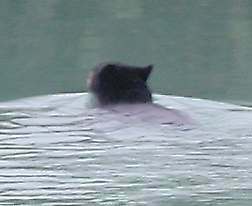 A small black bear was swimming across the river. I was O.K. with this.. I was... really! Then we got nearer. Ignorance on bear watching, and then the resulting fear entered my mind. Do bears jump out of the water into your boat? Do they tip boats? Are they faster than a 35 Yamaha four stroke? All trust in Chris vanished. Trust in the bear never existed! "CHRIS!" I yelled... I knew at the moment that I was about to ruin our bear experience. Half disappointed and even more half, hating myself for my fear and failure, I showed my fear to Chris. I need to be forced, sometimes, to do something I am afraid to do. Most often, afterwards, I am grateful to those who force me. Forced to trust. I was depending on Chris to shut me up so I could have this experience. Imagine my surprise when Chris, being the gentlemen he is, turned the boat around and sped off. Gentleman, yes.... But... disappointed in me for ruining his opportunity for photographing this bear he was also. His disappointment was very apparent and like the fog around me, the silence in the boat was thick. A few choice words were shared between us, and I decided to go back to camp. Maybe it was the constant togetherness in this wild Alaska, the stress of missing my flight. Maybe it was my sense of failing to be brave, and the resulting embarrassment, but I needed some time alone. Back at shore, I meekly crawled out of the boat, sad that I had caused a conflict, and sadder yet that I had missed a real bear experience. I wussed out on the bear test! Am I a sissy city girl or WHAT??? Time for a pedicure and a facial! Chris sped off for more fishing. I walked to the lodge to visit with the girls in camp and eat some of Shan's famous chocolate cake. I slowly walked back to my cabin, lay my body down on those soft flannel sheets and fell fast asleep. As I drifted off I remembered thinking... I will wake to someone pounding on my door to tell me a float plane is here. What seemed like moments later, which was actually two hours of solid sleep, I heard a beating at my door. Yeah right, I thought... I'm dreaming! I wasn't! The float plane was there! Well, actually, this picks up at the end of the day on the 19th... but it's all a blur to me now, as the 20th sort of melted into the 21st. There was no sleep in-between my nap, prior to the float plane out of Redoubt, and the nap I took on the flight home the next day. You know there is something unnerving about a float plane flight, when you can see down, most of the time, but the clouds and fog brush the tops of the wings of the plane, and the eyes of any creatures on land are visible. The curves in the Crescent river were the navigation points through the mountains in Lake Clark National Park. Once we hit Cook Inlet, things cleared a bit, and breathing resumed to normal. The landing was extremely smooth. Relief and sadness hit me at the same time. I was back on the main land. I was going to fish the Kenai again, but I also knew that my adventure at Redoubt had come to an end. Would I be back? Don't redoubt it! I'm going back for silvers! And bears! I am going to view a bear closer than I did! I have to. I failed the first time and it bugs me. I have to beat it! We returned to our rental car, which had been clicking away dollars as it sat, and drove to the Kenai airport to plead for my missed ERA and Alaska flight. They were very helpful, and had no problems in rescheduling me. In Alaska, these events are common. Another strong impression left on me that Mother Nature is in control here in Alaska, and we are but visitors, and sometimes victims of her wild moods. We then traveled to Clam Gulch, to pick up my bags. Kim greeted us with her warm smile and a couple of cold beers. We visited on her back deck, and told the stories of our adventures, and recounted her 60-or-so pound king conquest. Off to Kenai to meet Chris' group, who were camping at Fred Meyers. They do that! The parking lot was FULL to capacity with campers, trailers, boats and activity! Marv had made a bed in the suburban, and Joe, a bed in the sled! Plans to be made... It would be dark soon, should we sleep? Should we find a motel to rest until we could hit the Kenai at 1:30 or 2? Let's see.... Two motel rooms would run us a couple extra hundred... or.... we could drive around and see the sites! I choose site seeing! We watched the locals dip net for sockeye at midnight, saw a moose and her calf at one in the morning. Chris taught me the lay of the land around the Kenai and the different launch options. Then to the parking lot where we were to put in, to watch the night anglers pursue sockeye in the dark. Flashlights flashed around the river, the river was alive, even at 1:30 in the morning! At two, we got in the boat, and took off to fish. I have to tell you, I was totally exhausted at this point. A three and a half hour flight to Portland... I slept...! My Dad picked me up at PDX, and returned a very tired and happy girl to her car. The two hour journey down the Wilson River welcomed me back, and led me to my home on the Kilchis River. As I pulled into the driveway, a flock of Goldfinch flushed away from their feeding area by my office. The canyon lay still and windless, and as I opened my car door, the faint sound of the low river played a welcome song to me. I stood quietly in the canyon, and the sound of my sigh, as I stretched my tired muscles, resounded against the surrounding sleeping hillside. As I took it all in, I remembered Steve's voice, from Redoubt, saying... "I've never seen a girl so unhappy being stuck in the most beautiful place on earth". You should see my home, Steve! My kids opened the door, breaking the silence with welcome hugs and good cheer. Our voices competed with each other in excitement, recounting our separate adventures. Alaska.... I will be back! And next time I want the kids to go! I want them to know a thrill greater than that of an amusement park, and the wildlife and the untouched beauty that no travel brochure can express. The transition from Alaska to home has been quite difficult for me, and I know, deep down in my soul, I will never be quite the same. It's not the fish, it's not the wildlife, it's not any one thing. It's a feeling and experience I can't explain. I want to drive to Alaska next time. I want to gradually transition from one place to another. From one mindset, to another. From one beauty, to another.